The 2010 Mount Hood Silver Uncirculated Coin will mark the final 2010-dated strike in a series of five ounce silver coins from the United States Mint. 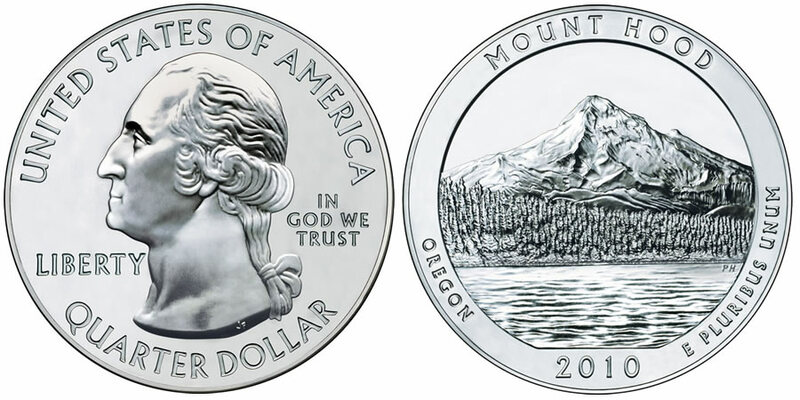 This particular coin honors Mount Hood National Forest of Oregon with a design showcased on its reverse. Mount Hood National Forest, which covers over 1 million acres, is one of the most visited national forests in the National Forest Service system. Its proximity of one hour's drive from the large population base of Portland, Oregon helps in that regard. The forest takes its name from the volcano within its boundaries also known as Mount Hood, which was named after British Admiral Samuel Hood in 1792. This series of strikes is known as the America the Beautiful Five Ounce Uncirculated Coins and are the collector versions of the Mint's America the Beautiful Silver Bullion Coin™ Program. Both are based on a third series of coins, also from the Mint, the America the Beautiful Quarters® Program and feature the same basic obverse and reverse designs. Each of the silver coins are struck from five ounces of .999 fine silver. The 2010-dated strikes in both silver series feature a diameter of three inches. That diameter may be adjusted slightly down in future year's releases however, as the law authorizing the bullion coins was modified after the 2010-dated coins had already been struck. George Washington, the first President of the United States, is featured on the obverse along with the inscriptions of "UNITED STATES OF AMERICA," " LIBERTY," "IN GOD WE TRUST" and "QUARTER DOLLAR." The portrait was originally designed by John Flanagan for the 1932 circulating quarter dollar. 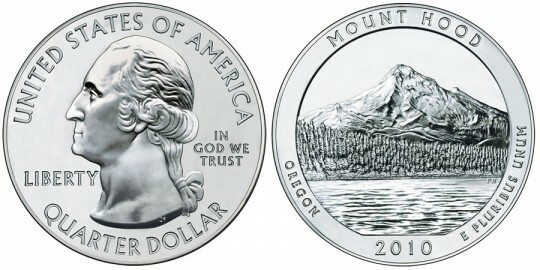 An image of Mount Hood off in the distance with Lost Lake shown in the foreground is shown on the reverse of the coin and was designed and sculpted by Phebe Hemphill. Also included are the inscriptions of "MOUNT HOOD," "OREGON," "E PLURIBUS UNUM" and "2010." The coin's weight and fineness of ".999 FINE SILVER 5.0 OUNCE" is struck on the edge of the coin.